Autumn and Winter always signify the season of vampy lips and every year when the temperatures drop I get super excited to pull out my favorite shades. In this post I've rounded up some of my favorite shades at all different price points. MAC 'Rebel' : Rebel is a mid-tone plum that has a creamy, satin finish. It is universally flattering shade and a great option for someone who is just dipping into vampy colors. NARS 'Mandore' : A medium, brown toned burgundy with a semi-matte finish. This shade does not have any trace of berry or blue tone - it is a true oxblood. Tom Ford 'Black Dahlia'* : Hands down my favorite lipstick of the bunch. It was sadly limited edition - but Bruised Plum is a close match to the shade. It is a true, deep, vampy wine color and packs an intense punch. The formula is matte, yet still hydrating and doesn't dry out the lips. NARS Audacious 'Charlotte' : An oxblood burgundy like Mandore, but unlike Mandore this shade has a bit of a cool tone running through it. MAC 'Diva' : A warm-toned oxblood with a matte finish. 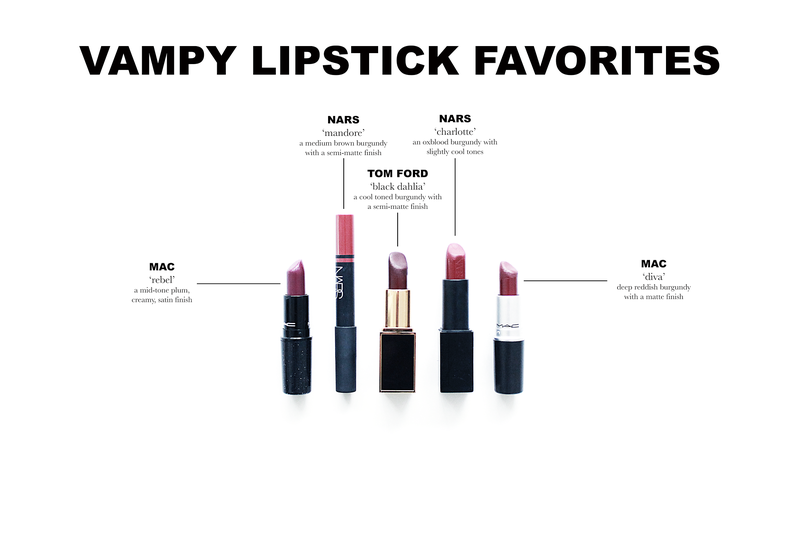 It has a rich, opaque color and is very comfortable on the lips.